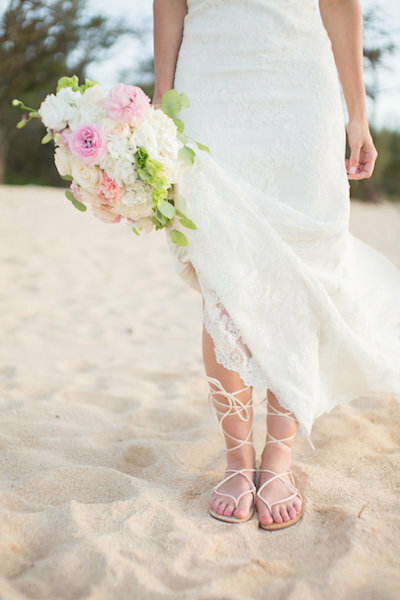 Debbie and Gary showed their flexible side at their Maui Wedding, and we are so grateful! The couple had planned to get married at sunset, but moved it up to the morning in case of the hurricane. Turns out that on their wedding night they were going to get evacuated because of a wildfire in Lahaina but they are all okay! Phew! We also had to change venue plans, but it ended up working out perfectly. You can always count on our team to make your wedding as amazing as possible! You’d never know by the fun everyone was having that Hurricane Lane was on it’s way. The happy couple had each other laughing nonstop, we are obsessed with their dance moves! They’ve had a lot of practice, Debbie and Gary love going to concerts and even had their first dance as husband and wife to “Barracuda”. Reverend Kuya even busted a move! If that doesn’t tell you they’re a fun couple, we don’t know what will! 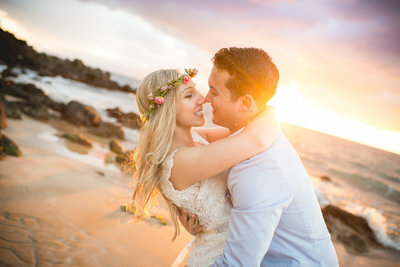 A Maui Wedding was perfect for these two! The bride and groom have been together for over 6 years, no wonder they are such good friends 🙂 . Gary was actually a confirmed bachelor when he and Debbie met. They began hanging out more and more, eventually moved in together, and decided to get married! We love their story so much. Their relationship is built on common interests, deep respect, and unconditional love. All the makings for a winning team! The whole wedding party are big Cardinals fans and changed into matching attire for some post-wedding celebrating. Some of the kids even jumped in the pool with their clothes on, causing laughter all around! Debbie and Gary, we cannot thank you enough for including the Simple Maui Wedding team in making this a day you will never forget! We wish you a lifetime of attending concerts, dancing, and making each other laugh. Congratulations and Warm Aloha! Thank you so much for helping us with our “dream wedding”. The photos are amazing, capturing us as we are everyday! 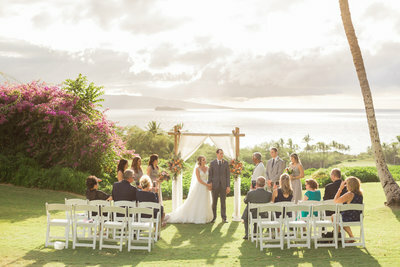 We highly recommend Simply Maui Wedding, even when there was nothing simple about it! Gorgeous flowers, scrumptious cake, and super awesome Reverend Kuay!! No hurricane or fire was going to prevent me from marrying my best friend!